Attorney. Specialist in business law, real property law and procedural law. 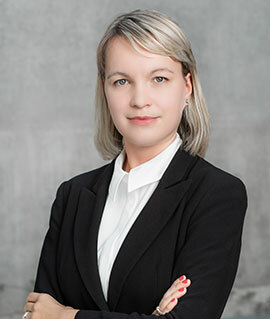 She handled numerous prestigious construction projects and projects regarding reprivatisation of land property and buildings on land in perpetual usufruct all over Poland. She provided advisory services on investment activity (including mergers and acquisitions) and operational activity of medium-sized and large enterprises being, among others, a co-author of a few listing on NewConnect and a Certified Advisor on this market. Member of authorities of Stowarzyszenie Instytut Remediacji Terenów Zanieczyszczonych (Institute of Remediation of Contaminated Sites Association). Author of publications in specialised press. Expert in TV programs on the real property law.